Suitable modules: Any module covering game theory. Abstract: Students participate in one round of an ultimatum game and one round of the same game in dictator form. Familiarise and understand ultimatum and dictator games. See that the ‘responder’ may have preferences that depend on relative earnings rather than purely maximising their pay off. Identify the key conflict faced by the ‘proposer’ to either maximise their payoff or play fairly. By playing the dictator game after the ultimatum game, they will be able to see whether a generous ultimatum offer by the ‘proposer’ is due to altruism or fear of rejection by the ‘responder’, it is almost always because of the fear of rejection. All students are given 4 forms so that their decisions as both ‘proposer’ and ‘responder’ in both the ultimatum and dictator games can be recorded. As a ‘proposer’: Decide how much you would ‘propose’ splitting £10 between yourself and another participant. Remember the other participant (the ‘responder’) has the power to reject your offer. As a ‘responder’: Decide whether to accept or reject the amount of money you have been offered out of the total £10 by the ‘proposer’. If you accept the offer you each keep the proposed amounts, if you reject the offer you both get nothing. As a 'dictator': Decide how much you would dictate splitting £10 between yourself and another participant. There is no opportunity for the other participant to reject your decision. All players are informed that they are playing anonymously throughout the experiment. Timing: The experiment takes approximately 30 minutes to run. Discussion of the results/data from the experiment can be done in the next lecture. An ultimatum proposal form for the participant to fill in how much they plan to keep and give out of £10. An ultimatum response form for the participant to fill in what they have been offered out of the £10 by another ‘proposer’ and whether they will accept or reject the offer. A dictator proposal form for the participant to fill in how much they plan to keep and give out of £10. A dictator response form for the participant to fill what they have been offered by the ‘dictator’, they cannot accept or reject this offer. Once the participants all have assigned numbers and each has the 4 forms, ask the participants to fill in the ultimatum proposal forms. Collect all of the ultimatum proposal forms and reassign them so that all participants receive a random ultimatum proposal. Ask the participants to fill in the ultimatum response form, based on the proposal they have just received. Collect all the ultimatum response forms in. Now choose one of the ultimatum response forms at random and read out to the class what (if any) the 2 players of the game would receive, this allows the participants to see an example of the result of the game. The dictator game is performed in the same way, the only difference is that the ‘responder’ has no choice whether to accept or reject the offer. Tips: To add interest to the game, give the actual payoffs to the 2 participants who are on the response form randomly selected at the end of each game. When analysing the results of the 2 games it may be good to add in demographic variables of the participants (gender, age, degree subject) to see if they have any impact on the participants’ behaviour. On average, in the ultimatum game the ‘proposers’ were willing to give £3.91 to the other participant, a similar ultimatum experiment carried out by Croson (1996) found the average offer to be £4.50, slightly higher than our findings. In our dictator game, the ‘dictator’ gave £0.58 on average to the other participant. This would suggest that fear of their ultimatum offer being rejected was the key reason for such generous ultimatum offers. Our average ‘dictator’ offer is far lower than has been found in other studies, for example, Forsythe et al. (1995) found that ‘dictators’ gave a mean average share of 20%, which would be £2 in our case. A similar one-stage ultimatum game study by Schotter, Weiss and Zapater (1996), where the participants had to decide how to split $10, gave similar behavioural patterns for offer frequencies. 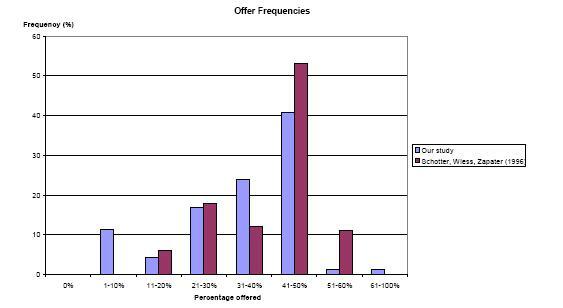 Shown in the graph below the most popular range of offers for both sets of data is 41-50%. Comparisons of conditional rejection frequencies for our study and the Schotter study vary quite a lot. From the graph below it appears that the participants in the Schotter study rejected low offers more frequently than was observed in our experiment. This is especially true when comparing the rejection frequencies of offers made between 11-20%, all offers were rejected in the Schotter study, in our study only a third of 11-20% offers were rejected. We also looked into whether the demographic variables: gender and degree subject, had an impact on the participant’s strategic behaviour and social preferences. Females were far more generous in both ‘proposer’ and ‘dictator’ roles than the males. A previous experiment of a dictator game with double anonymous conditions (Eckel and Grossman (1998)) found that females on average gave twice the amount to their anonymous partners in comparison to males. This outcome was also found in our dictator experiment, female ‘dictators’ on average gave £0.80 and male ‘dictators’ gave £0.39. 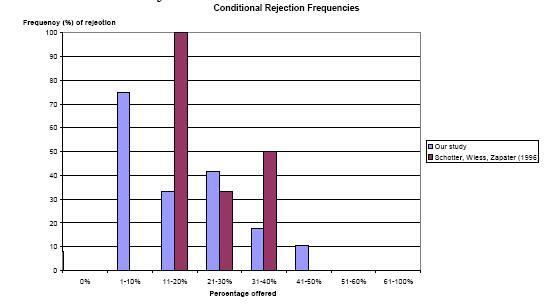 When comparing male and female conditional rejection frequencies, it appears that males have higher rejection frequencies for offers up to £2. Offers above £2 surprisingly have higher rejection frequencies from the female participants. The graphs below compare the gender conditional rejection frequencies of our ultimatum experiment and another study by Eckel and Grossman (2001). Although both studies show consistency of declining rejection frequency when offers increase, there are very few other significant similarities between the two studies results. Only at the percentage offer of 1-10% are there similar female and male conditional rejection frequencies for both our study and Eckel’s study. On average the economics students were the least generous group as both ‘proposer’, offering £3.25, and ‘dictator’, offering £0.38. Our findings were similar to those found in the study by Carter and Irons (1991) where it was found that economics students were willing to give on average, $3.85 out of $10, in comparison to the non-economists who gave, on average, $4.56 out of $10. Word document of the 4 forms handed out to participants. PowerPoint document shown to students. Camerar, C. F. (2003) Behavioural Game Theory: Experiments in Strategic Interaction, pp 48-83, Princeton, N.J: Princeton University Press. Holt, C. A. (2007) Markets, Games and Strategic Behaviour, pp147-157, Boston; London: Pearson Addison Wesley. Kagel, J. H. and Roth, A. E. (1995) The handbook of Experimental Economics, pp 296-304, Princeton, N.J: Princeton University Press. Güth, Werner, Schmittberger, and Schwarze (1982) An experimental analysis of ultimatum bargaining. Journal of Economic Behaviour and Organization, 3, pp.367-88. Forsythe et al. (1994) Fairness in simple bargaining experiments, Games and Economic Behaviour, 6, pp.347-369. Eckel, C. C. and Grossman, P. J. (1998) Are Women less selfish than men? : evidence from dictator experiments. The Economic Journal, 108, pp.726-735. Carter, J. R. and Irons, M. D. (1991), “Are Economists Different, and if so, Why?” Journal of Economics Perspectives, 5, pp.171-177. Croson, R. T. A. (1996), Information in ultimatum games: An experimental study. Journal of Economic Behaviour and Organization, 30, pp.197-212. Frank, R. H., T. Gilovich and D. T. Regan (1993), “Does Studying Economics Inhibit Cooperation?” Journal of Economic Perspectives 7, 159-171. Eckel, C. C. and Grossman, P. J. (2001) Chivalry and solidarity in ultimatum games. Economic Inquiry, 39, pp.171-188. Schotter, A., Weiss, A. and Zapater, I (1996) Fairness and survival in ultimatum and dictatorship games. Journal of Economic Behaviour and Organization, 31, pp.37-56. An Online Ultimatum Game (7th game in the list). This page was last edited on 22 February 2018, at 10:40.